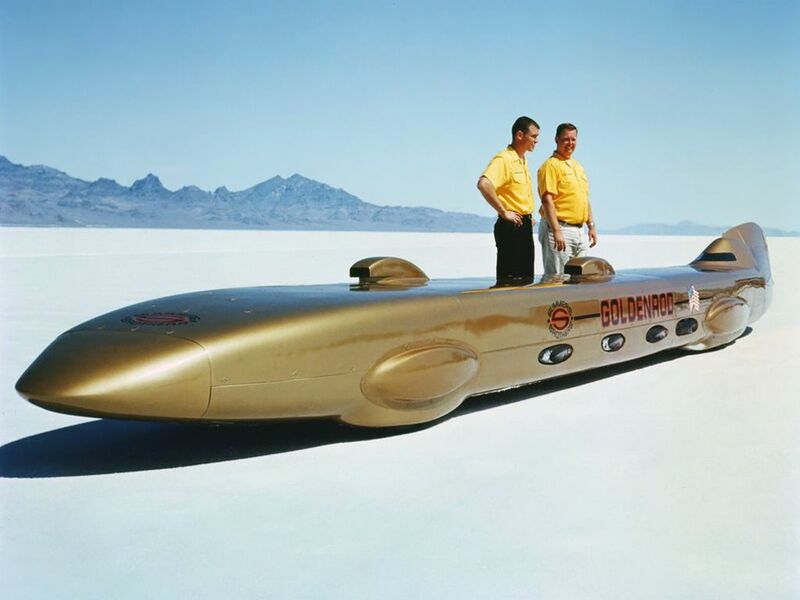 It was in 1965 that Bob Summers drove 'Goldenrod' to a new world land speed record - 409mph! History was made at the Bonneville Salt Flats - Utah's mythical Mecca of straight-line speed. What set Goldenrod apart from many of its rivals was its relative orthodoxy. It was, quintessentially, a 'car' ... albeit, one which pushed the automotive envelope! Whereas some of its contemporaries were borderline, at best, Goldenrod proudly proclaimed its 'roadster' credentials. Key to that claim was its engine. To wit, a 6.9 Chrysler V8. Well, actually, four 6.9 Chrysler V8s! The first two turned the front wheels - the third and fourth, the rear. Their combined output was 2,400bhp. And they were not even supercharged. Now, that is engineering! They were, however, fuel-injected - as you would expect. But, Goldenrod was about more than pure power! Its aerodynamics were just as important. The car was assembled in Ontario, California - by driver Summers, and his brother Bill. Sensibly, Bob built a mock-up, beforehand. It was this scaled-down model that first caught Chrysler's eye. Summers was sure that his dream could be realised. And - after studying the mock-up - Chrysler agreed. The green light was lit, and Goldenrod began to take shape. Its length alone - all 10 missile-like metres of it - buoyed Chrysler with confidence. Summers explained that Goldenrod's weight was to its advantage. It would force its aluminium wheels - shod, as they were, in Firestone tyres - solidly into the salt, he said. And he was right! Goldenrod duly snatched back the land speed record from Brit Donald Campbell. It was almost 40 years since the USA were fastest four-wheelers on Earth. Goldenrod shot straight out of 'hot rod' heaven! A shining example of mankind's need for speed.